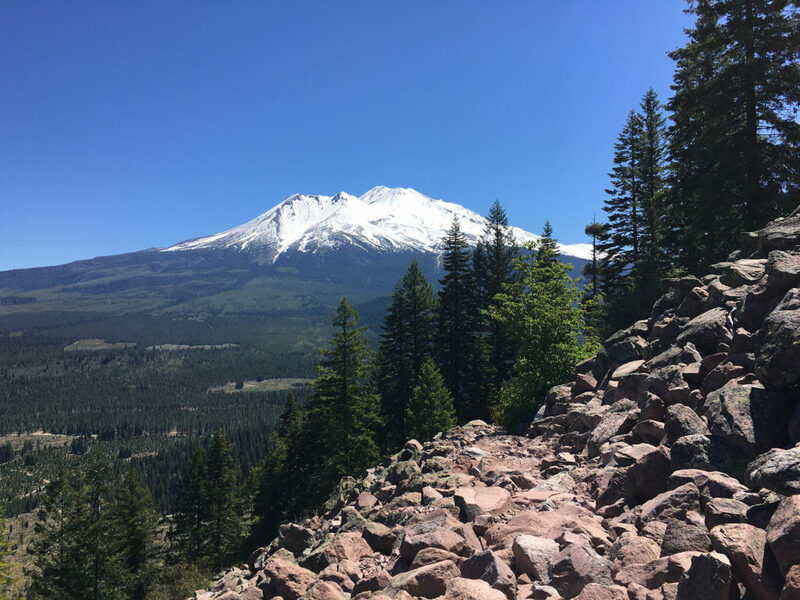 Back in 2016, I made a bucket list of things I wanted to do in Siskiyou, and one activity on my list included hiking to the Black Butte summit. For decades, I’d driven past Black Butte on my way to Siskiyou to visit family and friends, yet I’d never hiked the mountain, and I wanted to do it! A few days before our hiking trip, I read about Black Butte’s history. The summit of Black Butte previously housed a US Forest Service (USFS) Fire Lookout tower. The trail leading up to the top of the mountain was built by the USFS to reach the tower. A few decades ago, the structure was removed but the old foundation is still on the summit, and friends told me it was a great place to rest after hiking the trail. My husband and I attempted the hike in May 2016, but we only managed to walk a third of the trail. We left our home in Yreka in the morning, but we got lost on the way to the trailhead, and by the time we arrived it was already early afternoon. We weren’t sure if we’d make it to the summit due to the weather and late start, but we decided to see how far we could go. We didn’t hike very far because a light rain started falling and we could hear thunder in the distance. We didn’t feel comfortable walking to the top of Black Butte because the weather wasn’t ideal for walking on wet rocks above the tree line. Plus, the thunder was loud and a little scary. Thankfully, we had lightweight waterproof ponchos in our hiking backpacks, so we didn’t get too wet on our walk back to the car. On the trek back to the trailhead, we decided to try and hike to the summit in mid-June. Our second attempt to hike Black Butte was successful! I’m glad we started walking early in the morning because the trek took longer than we expected. The second half of the trail was rocky and steep, so I moved over the rocks carefully because I’m clumsy and didn’t want to fall. As I was climbing up the trail, a man was running down! I couldn’t believe how fast he moved. He bounded from rock to rock with no problem. I wanted to ask him if he ran the trail frequently, but he was a fast runner, and I didn’t get to chat with him. My slow pace helped me slow down and look at my surroundings. The views of Mount Shasta, the Eddy Mountain Range, Weed, and Shasta Valley were incredible! Since the sky was blue and clear, we were able to see Mount McLoughlin in Southern Oregon, too. I love eating good food, and we savored a picnic lunch at the top of Black Butte. While we ate lunch, we talked about where to eat dinner and decided on Mexican food in Weed. The thought of eating more delicious food with margaritas motivated us to hike down the mountain. —Lodging. Pair your hike to the Black Butte Summit with a stay at the Garden Gate Cottage or Stewart Mineral Springs in Weed, CA. You can read about my day trip to Stewart Mineral Springs here. —Hiking Black Butte Trail. Portions of the trail are rocky, challenging, and steep. However, the first mile of the trail is a relatively easy tree-lined hike with gorgeous views of Mt. Shasta and South Weed. 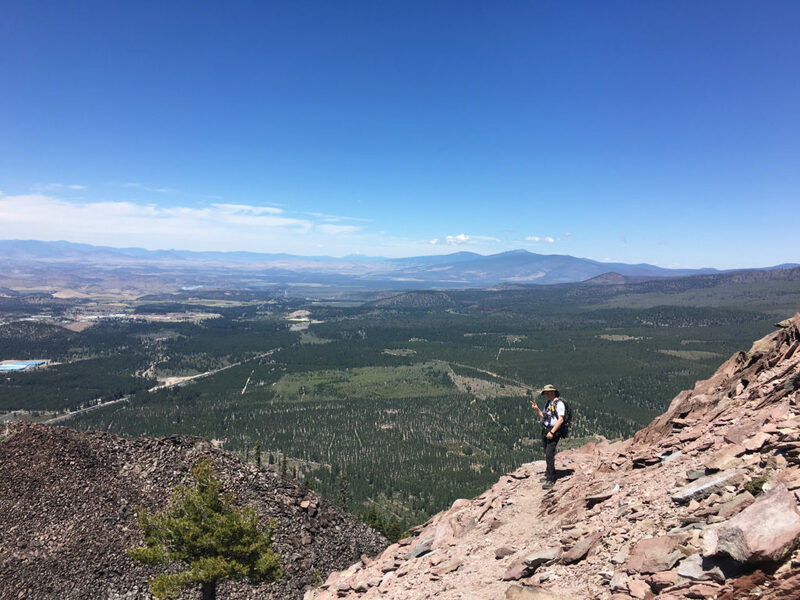 The path is roughly 5 miles round trip, the elevation gain is 1,827 feet, and the best time to hike the Black Butte Trail is mid-May through mid-November. You can find more information and helpful maps of the trail at the Mt. Shasta Trails Association. —Driving Directions. Black Butte is adjacent to Interstate Five, and it’s between Mt. Shasta and Weed, CA. Driving directions to the trailhead and a short trail description can be found here. —Good Eats. Before hitting the trail, pack a picnic. Alternatively, you can stop by Montgomery’s Meat Co. or Ellie’s Espresso & Bakery to pick up a deli sandwich and snacks for your adventure. And, don’t forget to bring water! After all the climbing, you’ll be hungry. I recommend trying Dos Amigos. It’s a family owned Mexican restaurant near the Pilot Travel Center in Weed, and they offer a delicious assortment of entrees. I’m a fan of their enchiladas, rice, and beans. If you’re not in the mood for Mexican food, try the Mt. Shasta Brewing Co. near the College of the Siskiyous campus.